If you close a credit card account, it doesn't automatically disappear from your credit report. 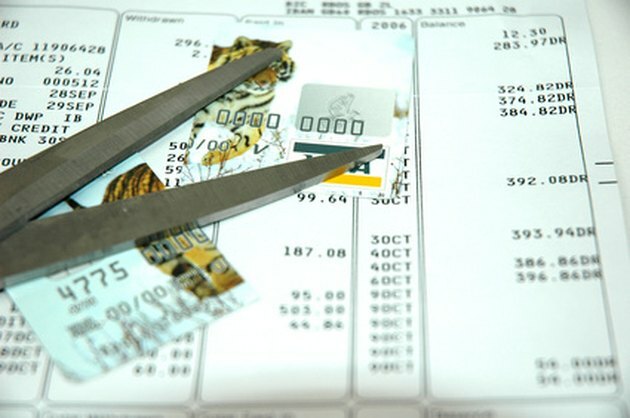 Depending on how you managed your credit while the account was still open, it can remain in your credit history for up to seven years if a poor payment history is reflected, but even longer if you made your payments on time and the account was paid in full according to the creditors' terms. It's doubtful that you'll want to remove good credit history, as reflected by a closed account that shows you handled it responsibly. But a closed account that suggests mismanagement only falls away through the process of time. If a negative closed account remains on your credit report past the time after which it should expire, you can dispute the record with the consumer reporting agency. Pull all three credit reports seven years after the account in question was closed. You can receive a free copy of your reports from Experian, Equifax and TransUnion by accessing the government-authorized website or by calling the corresponding phone number at 1-877-322-8228. Look over your reports to make sure that the closed account is still reflected in your credit history. Credit.com states that most expired records should automatically drop off your report -- in this case, after seven years. If the record remains past the time it should have expired, continue to Step 3. Dispute the record with Equifax and TransUnion in writing, advises Credit.com. In your letter, make sure you address the agency's Dispute Investigation Department. Include your name, address, phone number and Social Security number. Specify the record in question and state that you are disputing it because it should have expired. Experian requires you to file a dispute online. Include a copy of your credit report with the expired record highlighted or circled, advises the Federal Trade Commission. Also, if you have supporting documentation specifying the date on which the account was closed, include copies of this as well. Never part company with original documentation. Make copies of everything you send to Equifax or TransUnion. Allow the consumer reporting agency around 30 days to investigate your claim and send you its response in writing. If an expired record is removed by any of the three reporting agencies, you'll also receive a copy of your new credit report. If your credit card issuer has closed your account due to nonpayment, it will most likely to go an in-house collections department or be sold to a third-party collections agency. To understand how the debt collection process works, see Resources. Keep in mind that a record of a paid account that's closed at your request is different from an unpaid account that is closed by your creditor and charged off and/or sent to collections. Although these negative records are reflected on your credit report for seven years, the date on which the clock starts ticking may be later rather than sooner.